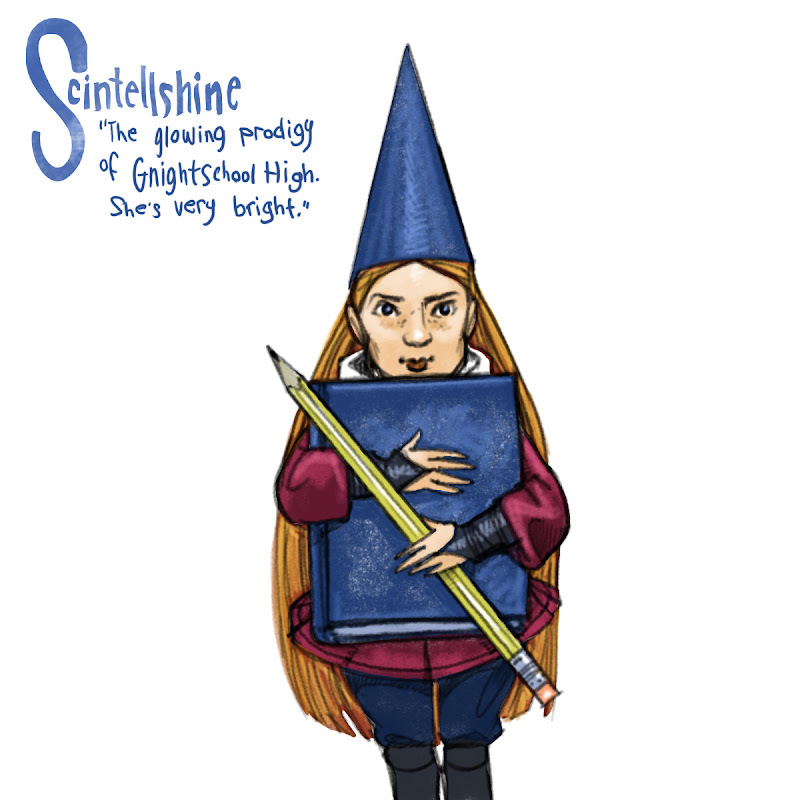 I like Scintellshine, and I'm waiting for someone (Nate or commenter) to give a good origin story of the gnome hats. Why do they all have those? For mind games, maybe we could do a "The Page is Right" game show. The person who guesses closest to your actual page count without going under (because we have to reward optimism) wins...something. How about you post the number of pages left each day and we suggest something that has to do with that number (ie, 10 pages left, 10 alien spaceships hovering over a house). You draw your favorite one. It'll be like I Will Drawing That For You. Oh, and are you going to draw a final group picture with all the gnomes? 'Cause that would be really nice. Oh, and I just noticed tht Scintellshine looks like Rapunzel from Rapunzel's Revenge, minus most of Rapunzel's hair. This gnome is so cute. And I like both Chris's and Katherine's ideas. I can't think of anything else right now, but I'll be working on it all day, I'm sure.